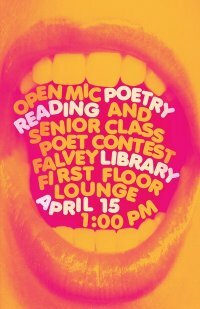 Poems by senior poets can be seen throughout Falvey’s first floor to promote their work and to celebrate April as National Poetry Month. The posted poems include “Intellectual Touch,” by Laura Freeman; “Drops of Red,” by Jimi Honochick; “Affirmations of a Big Footed Woman,” by Jennifer Nelson; “Nostalgia. Imagination. Dreams,” by Ivanley Noisette; “On Andrew Wyeth’s ‘Public Sale,'” by Elizabeth Milarcik; “Persephone, Across the Styx,” by Danielle Robert; “Pieces of Sound,” by Charlotte Thurston; “Sisterly Love,” by Allison Friedman; “Man’s Best Friend,” by Kimberly Jackson; “Morning in Manhattan,” by Brigid Black; and “Ode to Academia.” “Captured,” is one of several poems submitted by anonymous writers. The April 15 open mic poetry reading, featuring University and community poets, also celebrated the release of Arthology, Villanova University’s student journal of art and writing. Christine Simmons serves as its editor. Event organizers were Dr. Lisa Sewell, English department, Gerald Dierkes, Judy Olsen, Anne Ford and the Events team, Falvey Library. Posters were designed by Joanne Quinn and Chris Barr.